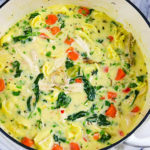 This creamy rotisserie chicken tortellini soup will hug your soul, it’s so damn good and super easy to create. Make your life easier by grabbing a rotisserie chicken from your local grocery store, trust me! To prep: Make sure the onion and red bell pepper are chopped at relatively the same size. Slice your celery down the middle lengthwise and chop into half-inch pieces. You want to make sure all the veggies are relatively the same size so they cook evenly. Don’t be afraid to add the leafy parts of the celery to the soup, they’re full of flavor. You can either slice or mince the garlic, whichever you prefer. I personally love thinly shaved garlic, but garlic is garlic. Do what you feel. Pull as much meat from your rotisserie chicken as you want, but make sure you use at least 2 cups. I personally used three, and I included both the white and dark meat and some pieces of skin. You can totally leave the skin out if you prefer. You can shred the chicken or shop it. Personally, I think you’ll prefer the mouthfeel of the shredded chicken, give it a try! It feels silky in your mouth. In a large pot or dutch oven, melt the butter over medium heat. Add the crushed red pepper flakes and herbs de provence to the butter to infuse and release their flavors. When the butter is foamy and fragrant, add the diced onion along with a nice big pinch of kosher salt and black pepper. Sauté the onion until softened slightly, about 3 minutes. Add the red bell pepper, celery, and carrots. Stir everything to make sure all the veggies are nicely coated in butter. Add another pinch of flaky kosher salt and black pepper. Cover the pot and allow the veggies to steam and soften for about 6 to 8 minutes. Test a large piece of carrot by biting into it. It should be firm but softened a bit. It will continue to cook later, but we just want to make sure they’re not rock hard at this point. If at any point you need to add a little extra fat, drizzle in a tablespoon of olive oil. Add the fresh sage, fresh thyme, and garlic. Stir to combine, cooking out the raw flavor of the garlic for about a minute. Stir in the all-purpose flour, making sure each veggie is coated. Cook for just about a minute, then pour in the chicken stock. Continue stirring to prevent lumps. Add the bay leaves, cayenne pepper, and onion powder. Stir to combine. Cover and and let simmer for about 8 to 10 minutes to allow the flour to give body to the soup. Adjust the heat if you realize your soup is simmering too hard. The texture you’re aiming for is that of canned chicken soup, where it’s “soupy” but velvety, with body. Remove the lid and continue simmering for another 2 to 3 minutes or until the veggies (mainly the carrots) are tender but not mushy. Taste the soup for salt and pepper levels, and adjust accordingly. Add the fresh cheese tortellini, stirring to emerge each piece in the soup. Allow the tortellini to cook for about a minute, then pour in the heavy cream (or half and half). Reduce the heat to medium-low and simmer for a couple minutes. Stir in the fresh spinach, then add the shredded rotisserie chicken. Continue to cook the soup for a few more minutes, or until the chicken is fully warmed through. Remove the bay leaves, and add the fresh nutmeg and lemon zest. Taste the soup and if you need to add a little acidity to balance the flavors, pour in a tiny bit of white wine vinegar or fresh lemon juice (about 2 teaspoons to a tablespoon) to brighten the flavor. Adjust salt and pepper at this time also. When the soup is giving you a hug in your mouth, it’s ready. Turn off the heat and serve. Enjoy! Store any leftover soup in plastic quart containers, or freeze in gallon-size ziploc bags for up to a month. You can find fresh cheese tortellini in your groceries refrigerated section. If all else fails, ASK someone who works there where it’s located. Feel free to use as much chicken as you prefer! That amount is totally up to you. We love chicken, so we used almost all of the meat. I recommend you start with two cups at the very least, both dark and white meat. Freshly ground nutmeg that you have to grate yourself is always best. If you have pre-ground nutmeg, please use a very tiny pinch! It’s far more finely ground than what you can do by hand.